I wrote here about a very distant cousin named James S. Trabue and my discovery that he had been killed in action on the last day of World War I. The only information I had about SGT Trabue was that he was from Pleasant Hill, Missouri, married Estella George in 1911 and was killed in action in 1918. After my request of his military service file came up empty handed I had to get creative. 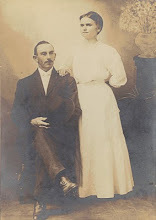 I first contacted the Pleasant Hill Missouri Historical Society to see if they had a Trabue family file or any information on the WWI casualties from their town. I received a quick email response to my query and soon thereafter a packet of copies from their files. The file included the above photo and several newspaper stories regarding SGT Trabue. From the newspaper articles, it appeared that he did indeed die on the last day of the war. It is also obvious that the family was not aware of the specifics of his death. James Trabue was killed on November 11 and his wife received notification of his death on December 3. The Pleasant Hill Times reported that "his fine, soldierly appearance was the subject of frequent admiring comment," and "the fact that he made the great sacrifice at practically the last moment of the war, escaping all the manifold dangers of previous rigorous campaigns up to that time, adds a touch of deeper regret to the tragic story of Sergt. Trabue." The newspaper articles also hinted that SGT Trabue died from a shell blast, but there was nothing to substantiate it. I am not a morbid person, but it was not enough for me to know only that he died on the last day of the war. I wanted to know what caused his death at the very last moment of the war. I included everything I knew about James Trabue to include death date, service number, unit and his next of kin. I received a quick response from the National Archives stating that they did indeed have his file. I ordered a copy of the file on CD for $25. The cost of the order varies based on the number of pages in the file. I received the file yesterday. It included 33 pages discussing the death and movement of the remains of SGT Trabue. His wife, Estella Trabue, chose to have his body returned to the United States for burial in Missouri, so the bulk of the documents in the file pertain to the details of that logistical move. And I do mean details. Every memo, telegram and form for SGT Trabue's movement from France to Missouri is noted. His body was originally buried in Letanne, Ardennes, France and traveled back to the United States through the port of Calais, arriving in Hoboken, New Jersey and then traveling by train to Louisville, Kentucky and finally to Pleasant Hill, Missouri. He was finally buried for the last time in April 1921. One document of particular genealogical interest is a form Estella Trabue had to complete that included the Soldier's next of kin and whether they were living or deceased and their addresses. The burial case file would also include information on whether the Soldier's mother or widow participated in the Gold Star Mothers pilgrimage program. This program offered mothers and widows of Soldiers killed during WWI a paid trip to Europe to visit the graves of their sons or husbands. And how did James S. Trabue die? The last page of the packet includes the only information about his death. SGT Trabue died alone from shrapnel wounds in a shell blast hole. I hope it helps...good luck! Ive been looking for this type of info for a year for the same reasons! Thanks Ancestry.com and Heather! So glad you came across my post, Lou! Hopefully it will be helpful...please let us know how it comes out! Thanks so much for this post and information. Did the burial file pages include any photographs? No, this particular file did not, though I have heard of some that do.